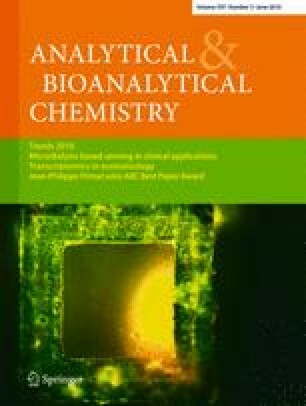 A new and selective sorbent for molecularly imprinted solid-phase extraction (MISPE) was developed and applied for the determination of residues of fenitrothion (FNT) in tomatoes, using HPLC coupled to photodiode array detection (HPLC-DAD). Using FNT as the template molecule, methacrylic acid as the functional monomer, ethylene glycol dimethacrylate as the cross-linker, toluene as the porogenic solvent, and bulk polymerization as the synthetic method, a molecularly imprinted polymer (MIP) was synthesized. In order to choose the medium which promotes the best molecular recognition of FNT by the MIP, the adsorption of FNT by the MIP was studied in different media containing acetonitrile and toluene. Besides FNT, three structurally related compounds were used to evaluate the selectivity of the FNT-molecularly imprinted polymer. The MIP exhibited the highest selective rebinding to FNT. The method developed was validated, using fortified blank tomato samples. The extraction efficiency was 96%. The limits of detection and quantitation were 0.050 and 0.130 µg g−1, respectively. The intra-day precision was 5.9% and the inter-day precision 8.1%. The accuracy was higher than 89% for a concentration level around the maximum residue limit of 0.5 µg g−1. The authors gratefully acknowledge financial support from CAPES and FAPESP (2007/02306-9), and thank Professor C.H. Collins for language assistance.